Bowers’ sharp eyes detected what he thought was a cairn; he was uneasy about it, but argued that it must be a sastrugus. Half an hour later he detected a black speck ahead. Soon we knew that this could not be a natural snow feature. We marched on, found that it was a black flag tied to a sledge bearer; near by the remains of a camp; sledge tracks and ski tracks going and coming and the clear trace of dogs’ paws—many dogs. This told us the whole story. The Norwegians have forestalled us and are first at the Pole. It is a terrible disappointment, and I am very sorry for my loyal companions. Many thoughts come and much discussion have we had. To-morrow we must march on to the Pole and then hasten home with all the speed we can compass. All the day dreams must go; it will be a wearisome return. We are descending in altitude—certainly also the Norwegians found an easy way up. Wednesday, January 17.—Camp 69. T. -22° at start. Night -21°. The Pole. Yes, but under very different circumstances from those expected. We have had a horrible day—add to our disappointment a head wind 4 to 5, with a temperature -22°, and companions labouring on with cold feet and hands. We started at 7.30, none of us having slept much after the shock of our discovery. We followed the Norwegian sledge tracks for some way; as far as we make out there are only two men. In about three miles we passed two small cairns. Then the weather overcast, and the tracks being increasingly drifted up and obviously going too far to the west, we decided to make straight for the Pole according to our calculations. 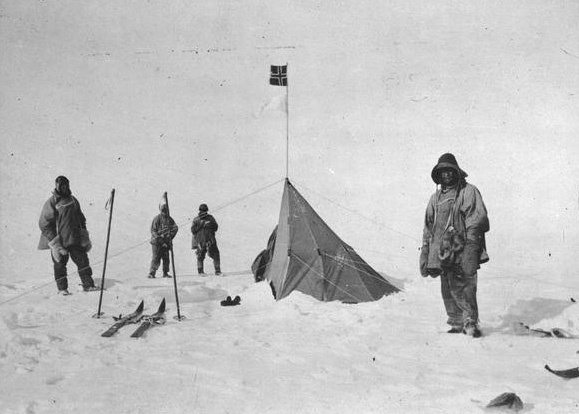 At 12.30 Evans had such cold hands we camped for lunch—an excellent ‘week-end one.’ We had marched 7.4 miles. Lat. sight gave 89° 53′ 37”. We started out and did 6 1/2 miles due south. To-night little Bowers is laying himself out to get sights in terrible difficult circumstances; the wind is blowing hard, T. -21°, and there is that curious damp, cold feeling in the air which chills one to the bone in no time. We have been descending again, I think, but there looks to be a rise ahead; otherwise there is very little that is different from the awful monotony of past days. Great God! this is an awful place and terrible enough for us to have laboured to it without the reward of priority. Well, it is something to have got here, and the wind may be our friend to-morrow. We have had a fat Polar hoosh in spite of our chagrin, and feel comfortable inside—added a small stick of chocolate and the queer taste of a cigarette brought by Wilson. Now for the run home and a desperate struggle. I wonder if we can do it. Sometimes it just doesn’t matter how much you want something, how much work you put into it, what you’ve given up, or what you’ve suffered. The universe doesn’t owe you a thing. A blank, white, untouched field of snow doesn’t always mean that the promise offered will be fulfilled. Sometimes it means an awful soul-wearing trudge and the discovery that someone else has beat you to the punch. Still, you march on. You do the thing you set out to do. You’ve come this far, after all. And when you’ve reached the bottom of the world, you have no other choice than to head back the way you came.